For the last time… I checked the front pocket. Bear, then one, in the Ergo. For the last time… I threw it in the washer. For the last time… I hung it to dry, untangling the straps. For the first time… I packed it in a box and sent it on its way. In 2007, when the Princess was about 13 months old, I purchased an Ergo. This was a big purchase for us, as they can be pretty pricey and my husband wasn’t convinced I needed yet another baby carrier. I knew I needed something, though. She was getting too heavy to carry on my hip for long distances and could be pretty grabby while I was cooking dinner. I borrowed an Ergo from a friend and found I loved it! I could cook dinner without her trying to dive-bomb into the skillet. I could carry her for long distances without my shoulders or back hurting and, best of all, a fussy toddler in the ergo plus vacuuming ment she would pass out for a nap! Over the years, the Ergo proved to be one of our best baby related purchases. Toddlers were carried all over town from the safety of my back, giving them the best view of events and keeping them out of trouble! I’ve rocked and patted fussy babies to sleep, taken long walks, helped in my kids’ classrooms, cooked dinner and coached a swim team, all with a baby or toddler safely strapped to me in the carrier. In fact, most pictures of me also feature a child being worn. For us, it was simply a way of life for many years. Now, that way of life is being phased out. My oldest is ten and my youngest is nearly four. Bear hasn’t tolerated being worn for a long time. He likes to be held and he likes snuggles but the Ergo? No thanks. I can’t hold onto something that can be used by another family. It’s time for it to go to a new mother, who will love and use the Ergo. I can only hope that they form many wonderful memories with it, just like I have with my children. Although I loved my Ergo, I also used a homemade ring sling for my babies. Other volunteers have loved the Moby Wrap<?a>, Beco, Onya and AngelPack. Different carriers work for different body types and parent/child pairs. If you see someone wearing a baby, ask about their carrier! 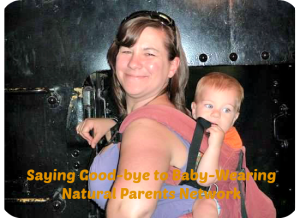 Most people are more than happy to chat about the babywearing carriers they love!